This Homemade Baklava recipe takes time, but it is SO worth it! This Baklava is perfect for family functions, parties, or for gifting! This homemade baklava is super time-intensive but I would argue that it is well worth the time. It’s such a delicious and impressive dessert that’s perfect for fall. Combine syrup ingredients in small saucepan and bring to full boil over medium-high heat, stirring occasionally to ensure that sugar dissolves. Pulse almonds in food processor until very finely chopped, about twenty 1-second pulses; transfer to medium bowl. Pulse walnuts in food processor until very finely chopped, about fifteen 1-second pulses; transfer to bowl with almonds and toss to combine. Measure out 1 tablespoon nuts and set aside for garnish. Add cinnamon, cloves, sugar, and salt; toss well to combine. Brush 13- by 9-inch traditional (not nonstick) baking pan with butter. Unwrap and unfold phyllo on large cutting board; carefully smooth with hands to flatten. Using the baking pan as a guide, cut sheets crosswise with chef’s knife, yielding two roughly evenly sized stacks of phyllo (one may be narrower than other). Cover with plastic wrap, then damp kitchen towel to prevent drying. Place one phyllo sheet (from wider stack) in bottom of baking pan and brush until completely coated with butter. Repeat with 7 more phyllo sheets (from wider stack), brushing each with butter. Evenly distribute about 1 cup nuts over phyllo. Cover nuts with phyllo sheet (from narrower stack) and dab with butter (phyllo will slip if butter is brushed on). Repeat with 5 more phyllo sheets (from narrower stack), staggering sheets slightly if necessary to cover nuts, and brushing each with butter. Repeat layering with additional 1 cup nuts, 6 sheets phyllo, and remaining 1 cup nuts. Finish with 8 to 10 sheets phyllo (from wider stack), using nicest and most intact sheets for uppermost layers and brushing each except final sheet with butter. Bake until golden and crisped, about 1 ½ hours, rotating baking pan halfway through baking. 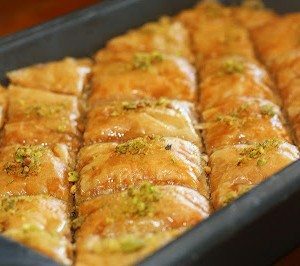 Immediately after removing baklava from oven, pour cooled syrup over cut lines until about 2 tablespoons remain (syrup will sizzle when it hits hot pan); drizzle remaining syrup over surface. Garnish center of each piece with pinch of reserved ground nuts. Cool to room temperature on wire rack, about 3 hours, then cover with foil and let stand at least 8 hours before serving. (Once cooled, baklava can be served, but flavor and texture improve if left to stand at least 8 hours. Baklava can be wrapped tightly in foil and kept at room temperature up to 10 days. ).